I'm suffering from a bit of bloggers block at the moment so there was only one post last week, but I attempted some nail art a couple of nights ago that I'm really pleased with so I thought I'd do a post for it. I'm really particular about the nail art that makes it onto my blog and recently all of my attempts haven't been good enough, so this is my first nail art post since June! My inspiration for this nail art came from some false nails from Primark that I posted on Instagram. I don't bother with false nails as one always pings off pretty much straight away and then I just pull the others off. 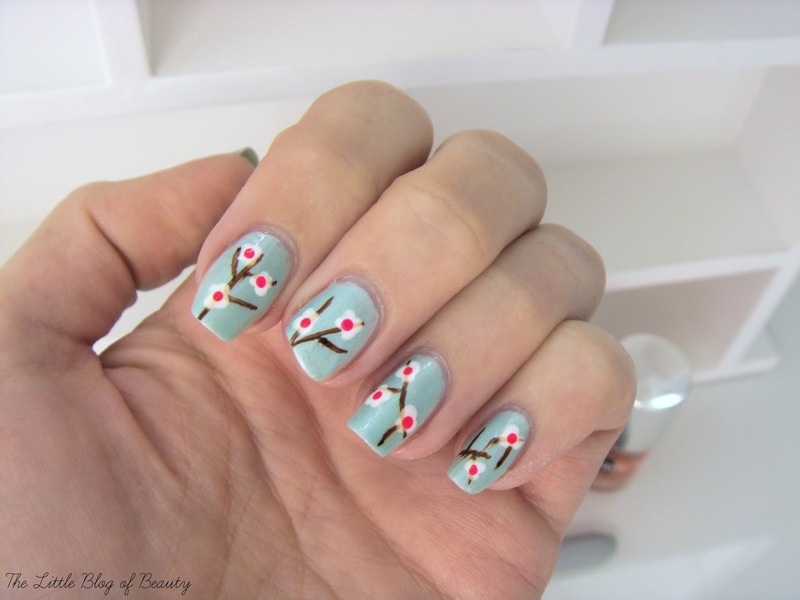 I love Japanese cherry blossom designs though, so I thought I'd give this a try as nail art when I got home. I started off with a new base coat (Nails Inc Hyde Park) that I won in Fiona's giveaway over on girl, with lipstick. I then used Barry M's Silk nail varnish in Meadow as a base colour as this is probably the closest colour I have to the base colour on the false nails. I then drew on the branches using a brown Sharpie. I've recently bought a big pack of Sharpie's in various different colours that will be really useful for nail art. I then used a dotting tool with Sinful Colors Snow me white for the white flowers and Models Own Neon in Bubblegum for the centre of each flower. I then left this for a while before applying the top coat as Sharpie's can smudge if you're not careful. Unfortunately the little finger did smudge, either because that was the last nail I did or I went over it a few too many times with the brush. Please excuse my short and slightly funny shaped middle nail, it snapped off on my car boot earlier in the day and I don't want to cut my other nails down to the same length. The design also doesn't look as good in the photo as it does on my nails, for some reason it looks a little sparse. 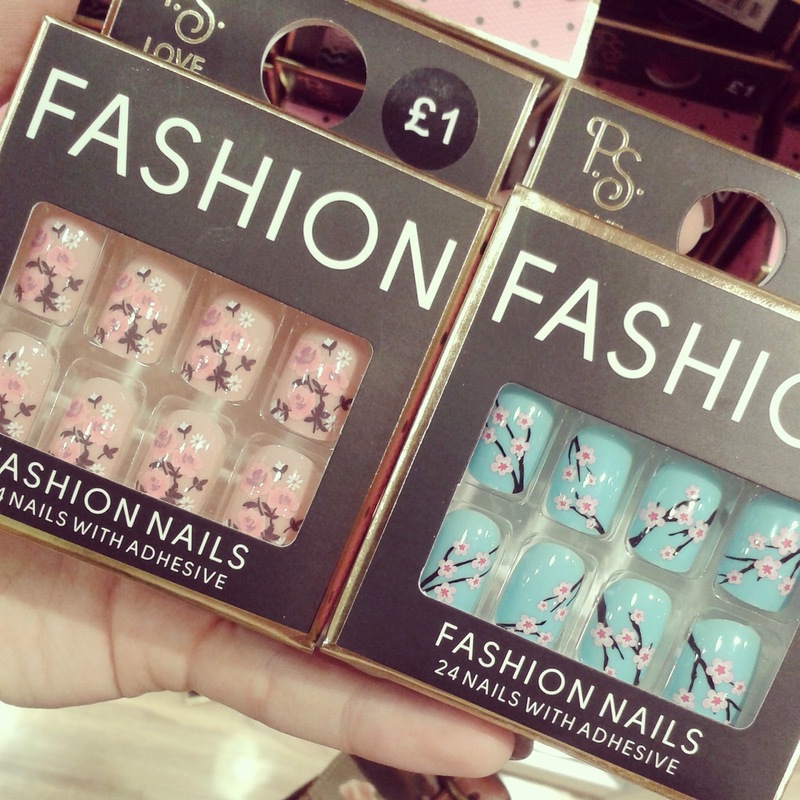 What do you think of Japanese cherry blossom nails?